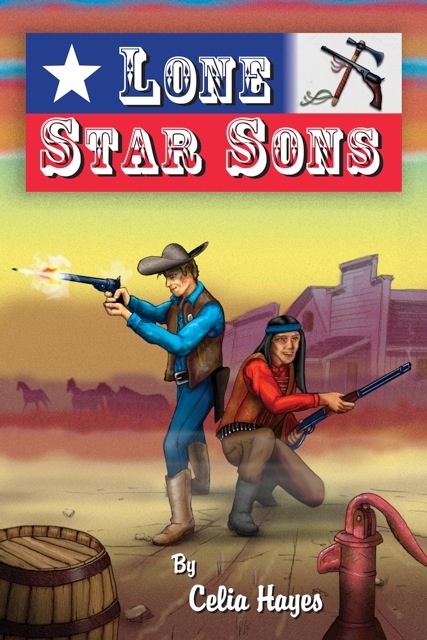 Lone Star Sons is my reworking of a certain classic western adventure, in the wake of last year’s disastrous movie attempt to re-launch it. I suggested in various blog posts here, and in other author blogs, that the only hope for the franchise was to eliminate some very identifiable features on the basis of sheer improbability, keep certain classic Western story principles, and rewrite it all as a straight historical adventure, set in 1840s Texas. There was, I argued, a whole wide-open range of interesting events and characters to explore … and the more I thought about it all, the more fun it looked like being. So – I went and did the initial establishing adventure. It’s a little more of a romp than the other books, and is intended for the YA audience, especially boys of all ages who have sorely missed traditional Western heroes, the Cowboy Way, and all that. And then I wrote another, and another. 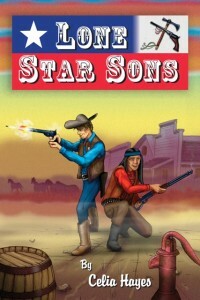 Very likely I will write some more, for a second volume of the adventures of the Lone Star Sons, Jim and Toby. Also available here on Amazon, in both print and Kindle versions! A dark winged shadow sailed on motionless wings. Jim Reade lay on his back in the desert dust, incuriously watching that ominous shadow circle, lower and lower until every finger-like dark feather became distinct against the burning sky, aware in a tiny corner of his mind that he should do something, should move. But he hurt in every bone, from his head down to his fingertips, and all the way to his booted toes. There was something flint-hard under his shoulder, unyielding, the sun had blazed on his exposed face and hands for many hours, and there was a mass of congealed blood which had oozed from his forehead, running back into his sweat-matted hair. It took a great deal of concentration and will to move his right hand, dropping the object clenched in it – his hunting knife – with a brief metallic clatter. Why was the knife in his hand? Had he tried to free himself from the saddle? He must have. The dark-winged shadow veered abruptly away. That sight recalled him to a sense of danger. Turkey vulture. Dropping down on something freshly – or not so freshly dead. What had happened? Jim willed his eyes and his memory to focus. But I’m a lawyer, Jim had said to Daniel, when they met at Daniel’s little house in Bastrop, after Jim came hastening all the way from Galveston in answer to Daniel’s urgent message. The Mexes have taken Bexar, Daniel had written. General Woll came from the west with a whole army; they took every white man prisoner there, including Daddy – and dragged them back to Mexico in chains. Captain Hays, he’s already gone to follow them, with every man he could muster. So is Daddy a lawyer, Daniel answered, white with suppressed fury. And those bastards took him with all the others there for the district court. The judge, the recorder, the district attorney – all the defense attorneys, the clerk and every one of those who had suits to be judged or came as witnesses. They brought their whole damned army to invade … again – and took them prisoner just for doing their civil duty. You’re a lawyer, little brother – but what happens when the law don’t do you no good at all? You put down your law books and you pick up a Colt. Else the law don’t mean anything at all. Join my company, pick up your trash – that which you can hitch to your saddle, and let’s you and I go rescue Daddy. Jim Reade gathered up his scattered thoughts again. What had happened to him? Where were Daniel, and the four other Rangers who had gone out on long scout at Cap’n Hays’ orders? He couldn’t remember which worried him. It cost him some pain to turn his head – the blue sky, the turkey-vulture floating lazily in it, the dappled body of his dead horse – all swam together. He pressed his eyelids tight together, waiting until the pounding of his heart stopped sending scorching patterns of light against them. Now Jim squinted against the blinding sun, falling almost parallel across the rolling desert scrubland and flat-topped hills along the bottomlands of the Nueces River. There were shadows, stretching out … and the tumbled still forms of men, laying in the unnatural positions in which sudden death had found them. They sprawled like rag dolls, and horribly splotched with blood already gone the color of dark red morocco leather, at throat, back or breast. The nearest to him wore a dark blue hunting coat, just like his brother – his hair the same light brown, and that was Daniel’s plain straw planter’s hat, hanging from a branch of mesquite shrub, tossing in the light breeze. “Dan! Dan’l … Cap’n Reade!” Jim croaked. He attempted to rise, by rolling onto one side and levering his elbow against the ground, but unbearable, searing pain exploded in his shoulder and the black darkness descended again. After a time, that darkness receded. Jim blinked, hardly believing what he saw. The shadowy form of a man loomed over him, a young and weather-burnt face with a quizzical expression on it. Dark Indian braids hung over the young man’s naked shoulders, and three lines in red ocher painted across his cheeks. Comanche – he was done for, surely, Jim decided in despair. The shape he was in, he wouldn’t last long, under whatever torture the Comanche had in mind – and with any luck at all he should be unconscious almost at once. 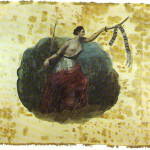 The other Rangers – and every settler in Texas, Anglo and Mexican alike – they all had stories of the sickening tortures which the Comanche inflicted on their live captives. The next time Jim swam up to the surface of life, he was in a place that was dark, but dimly lit with moving shadows – a fire, a little distance from him. The sharp object under his shoulder was gone. It seemed that he lay on something relatively soft, inside the shelter of a shallow cave. He still hurt all over, but the pain was a lesser thing now, in his shoulder and arm, and in his head, which ached fiercely when he turned it to look in the direction of the fire. There was someone sitting beyond it, in the mouth of the small cave, silhouetted against a darkly-starry sky above, and a thicket of those spiny, thick-leaved cactus plants – the ripe red fruit and tender young leaves of which the Mexicans in Bexar relished very much. Jim struggled to focus his eyes and attention. He must have made some involuntary movement or a noise, for that someone stood, swift and almost noiseless, and padded around the fire with a plain tin cup in hand – the young Indian. “You are aware,” he remarked, in good humor. “Good. This is sage and willow-bark tea. Very healing properties.” The young Indian knelt next to the rough pallet of blankets on which Jim lay, raised his head and held the cup to his lips so that he might drink easily. “I am sorry. I spoke rashly,” Jim answered, abashed. “I am James Reade, Esquire. I am pleased by your acquaintance, Mr. Shaw… and also grateful for the consideration.” Jim realized belatedly that his arm – the one which had pained him with especial agony – was splinted and bound. And that his head was roughly bound up – the blood from that wound washed away from where it had crusted over his eyes. “I did not intend insult, Mr. Shaw.” He swallowed painfully against his grief, wondering why he was moved to speak with such odd formality. Before he was ten years old, he had lost two little brothers and and older sister – and now Daniel – Daniel, his oldest brother, stubborn, fearless and daring, who had fought with Houston on the field at San Jacinto, not six years ago. Daniel left a wife and three children in Bastrop. The Reades would never leave Rebecca, the boys and their sister to beggary – but if Jim survived this mad affray into the wilderness, he would be the one to bring the sad news to Rebecca. His heart sank at the prospect of that errand. “I am sorry,” Toby Shaw arranged himself more comfortably at the side of where Jim lay, crossing his legs and setting the tin cup aside. He leaned forward, looking at Jim with a most earnest expression. The firelight at the mouth of the cave now fell sideways across his face and shoulders. Jim realized that Toby was quite young, not much above his own age of twenty-three, for all the weathering of his face; a wiry, long-faced youth with the high-cheekbones and straight line of lips so often seen among the tribes of people which Jim had knowledge of. Toby wore a tattered black frock coat against the coolness of early evening, a coat which pulled across his shoulders and left his brown wrists bare, for lack of shirt-cuffs. “There is indeed something wrong. I do not know why, not in words you would understand. My uncle said I should follow the setting sun, where the men of General Somervell’s army were going. It was a test, I think. There are tests among the People. He said I should wait for dreams … a vision given to me by the Elder Spirits who would guide me.” His expression was totally without guile, honest, open, and puzzled. “It was a baggage cart, from Woll’s train,” Jim coughed and coughed again, rackingly. He was beginning to recover his memory. Yes. That was it; the puzzle of a single cart, deviating from the churned trail of General Woll’s extensive baggage train. “We … we saw the track, too. Capn’ Hays, he would have thought nothing of it, save that maybe some of the Mexes had decided to desert an’ go home their own way, but Bigfoot Wallace an’ some of his, they caught up to and tangled with a dozen Mexican cavalry troopers, a fair distance off the trail. They were heading west by north … not towards Mexico. It looked to ol’ Bigfoot as if they were following the wagon trail.” Toby Shaw held the tin cup to his lips and Jim drank again. The memory of it came clear, sharp around the edges as a shard of glass, the one thing he could recall of the last few days. Bigfoot Bill Wallace, a mountain among Hays’ Rangers, exuberant about returning victorious in the clash with the Mexican troopers – he and Captain Hays, Daniel and some others, gathered around the evening fire, listening to Bigfoot tell the tale, of pursuit and clash, and leaving the surviving Mexican troopers dispirited and on foot in the harsh desert, limping south toward the Rio Grande. “What were they doing, Bill – so far from the baggage train an’ Woll’s company?” Captain Hays asked. In the firelight he looked as untried as a mere boy, gentle-spoken and modest, but Jim had already learned not to underestimate the Ranger captain. He might have looked as if he were hardly older than Jim himself, but Jack Hays had the heart of a lion, an iron will and a sense of daring which stopped the heart of other men – but inspired them to follow him. Bigfoot Bill Wallace, Daniel, Chief Placido of the Tonkawa, and proven fighters twice his age – all followed where Captain Hays led, without question. “What do you think, Jack?” Daniel had asked, and no one thought it the least insubordinate in seeming to question an order – or as near to an order as Jack Hays ever gave. “And did you find that devilment?” Toby Shaw asked. Jim shook his head without thinking, a gesture which redoubled the pain in it, as well as the nausea – almost to the point of vomiting up the herb-tea which Toby had gotten him to drink. “You knew them?” Toby demanded, suddenly alert. “I recognized them,” Jim answered, racking his memory again. “They were rangers, all four of them, but in another company. I saw them in Capn’ Hays’ camp. Their leader is a man named Gallantin, J. J. Gallantin. Dan’l knew him from the war, when we took Bexar the first time. He was at the fire, when Bigfoot talked about the wagon. I think he wanted to come with us at the start … but Cap’n Hays gave the order to Dan’l. They came up to us, laughing … they were chaffing Dan’l for lagging behind. They came up on us and dismounted and then … I can’t remember.” Try as he could, Jim could bring up nothing from that memory crystal but the sound of a gun-shot going off like cannon and his horse screaming, a high and unnatural sound – the part-memory of it still made the hair on the back of his neck stand up. Toby nodded, with the look of a man who had solved a puzzle. “Thank you,” Jim said, strangely grateful. And then the dark sleep took him under again, somewhat broken by uncomfortably vivid dreams. “You should return to Bexar,” Toby Shaw urged Jim, on the day that he was well enough to stand and walk a little way beyond the shelter of the cave. Jim shook his head. They were sitting companionably on either side of the small fire which burned in the mouth of the shallow cave. The single horse which had escaped the treachery of Gallantin and his renegades was picketed a short way away, moodily nibbling on a stand of long yellow grass; a brown and white pony with a wall-eye and a jittery temper. Jim hadn’t known his owner long enough to put a name to horse or rider – but the beast likely panicked when the renegades had murdered the Rangers. While Jim had lain unconscious on the rough pallet of blankets in the cave, Toby had retrieved Jim’s saddle-bags, with the books and Paterson revolvers, although not the Springfield. The renegades had taken it which Jim regretted, as it had been fitted with a percussion lock, instead of the old-style flintlock, and the haversack with the lead shot and his large powder-horn. They had missed the Patersons, which was fortunate. “Would that you had found two of them,” Jim answered and Toby chuckled. “Mining for lead never appealed to me,” Jim answered. “Too messy.” Chuckling, Toby handed him one of the blackened wood skewers, threaded with shreds of meat which were hardly any lighter than the wood. Or any tenderer, as Jim discovered, although the sizzling meat gave off an aroma so as to make his mouth water in anticipation. They chewed away companionably, while the sun slid lower and lower in the sky, final slipping below the horizon in a brilliant smear of dark orange, threaded with gold-edged smears of purple cloud. Jim thought of the straight-ruled ruts made by a heavy wagon, the disarrangement of the soil left by the teams which pulled it … and now the trail of the renegades and their stolen horses. Yes, there would be clear markings in the arid desert, where things grew slowly and the marks left by men and animals lasted long. In the chill, directionless light of dawn, the two broke camp. It did not take any time at all, merely a moment to quench the tiny fire with a swift kick of dirt over it. Toby helped Jim saddle the wall-eyed brown and white pony and tighten the girths, for he could not manage that one-armed. It was a further bit of good luck that the wall-eyed pony had not managed to scrape off the saddle, or shed the bridle, for Jim doubted that he could have ridden the beast otherwise. One rolled blanket went behind the saddle and the other over Toby’s shoulder. Toby hefted his war-hatchet – a stout maple shaft of some age and very well worn, set with shell beadwork and terminated at the business end with a double-headed metal fitting. One side was a curving metal blade of antique design, viciously sharp and rather like a hatchet, balanced on the other by a shape like a blunt hammer-head. A leather quiver of freshly-fletched arrows and a bow-case with a short bow strung with buffalo sinews completed Toby’s baggage. In riding a horse, with saddle-bags well-filled with his own oddments and supplies – including Blackstone’s Commentaries – Jim felt as if he was driving a Conestoga wagon filled to the canvas cover, in comparison. WOW! You write like Larry McMurtry! A question that I have is why would the Governor of Sonora be interested in scalps taken or incidents happening in Texas? Also, please tell me how a reworking of a classic works. Thanks, PJ! Yes, tis true, the character that I have based Gallatin on was hired as a scalp-hunter by a Mexican governor – only at a slightly later date – to collect Apache scalps. Only he branched out a little. At this time, Mexico claimed pretty much all the southwest, and the border with Texas itself was pretty fluid. I am just taking certain elements from that classic, utilizing the Cowboy Code, and coming up with a whole set of new adventures … although one or two of them are based on classic plots. For the adventure I am currently writing for Jim and Toby, I have appropriated the plot of Three Godfathers. That was most enjoyable. I shall certainly read the next three. This brighten up a very boring night at work! My pleasure, Scott – I should have another adventure completed and posted by the end of the weekend as well, so enjoy them all!